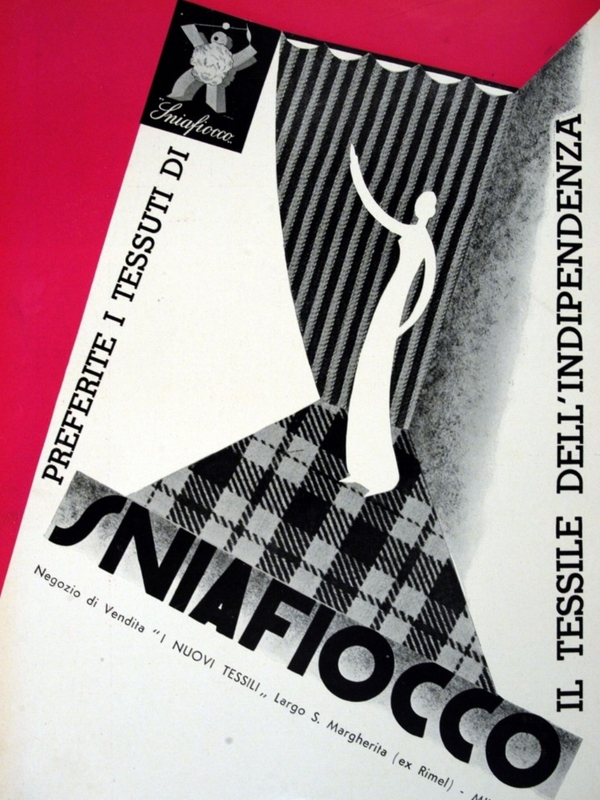 SniaFiocco, The Textile of Independence. From Lidel, June 1933, Biblioteca Nazionale, Rome. Under Fascism, fashion and film were both identified by the totalitarian regime as powerful vehicles for shaping and projecting national identity and a politics of style. As such, they became recognizable cultural institutions of Italian modernity. No government in post-unified Italy (the period from 1860 onwards) had been able to create anything like the distinct image with which fascism made itself visible: the black shirt, which still today epitomizes the image of fascism and the Duce. Fascism understood very quickly how powerful a medium cinema was for the diffusion of visual messages. It was with massive State support, in fact, that Italian cinema rapidly developed in the 1930s. In the early 1930s, the first regime-sponsored fascist propaganda feature films were made such as Gioacchino Forzano’s Camicia Nera (Man of Courage, 1933), the story of the reclamation of the malaria ridden Pontine marshes by the regime, and Alessandro Blasetti’s Vecchia Guardia (1934), celebrating, twelve years on, the March on Rome and the “success” of the regime in saving Italy. However, overtly propagandistic feature films such as Camicia nera and Vecchia Guardia were in the numerical minority when compared to the other genres of film made under fascism. In fact, it is inaccurate to think of film under fascism as merely a vehicle for political propaganda. Things were much more complex than that. A study of film under fascism involves an in-depth investigation of the stylistic forms adopted in the filmmaking of the period. Not only did fascism see in cinema a powerful medium that would help it achieve its ends, it also saw fashion in the same way. In fact, the regime invested a great deal of energy in and exercised state control over the fashion industry. It was under fascism that fashion and film first travelled at the same speed. Dress in printed silk in blue, gray and purple, by Fercioni. Biblioteca Nazionale, Rome. Following the crisis in the post WWI years of the Italian film industry it was in the 1930s, the period of the consolidation of the fascist regime, that Italian cinema saw an important moment of rebirth with the inauguration of the “Città del cinema” or Cinecittà and the school of cinematography, the Centro Sperimentale di Cinematografia, hereafter CSC. This was part of the massive reorganization of both the film industry and educational institutions that took place under the fascist regime. It was also at this time that the fashion industry was organized under several national boards and state controlled institutions and was greatly promoted through the media, film, newsreels of the LUCE Institute, periodicals, fashion shows with lively mannequins and also fashion exhibitions in several Italian cities (Milan, Turin, Rome and Venice). With the Luce newsreels, we have the first cinematic documentation of fashion shows and fashion parades that had the specific aim of advertising Italian products. Fashion in motion in the 1910s was conveyed through the divas in fiction films; now with the fascist regime we see professional models advertising fashion. It is relevant to note this shift in the Italian context and how the regime was “selling images of fashion as paths to modernity,” a phenomenon studied by sociologist Elizabeth Wissinger. She writes: “models led the way into a consumption-defined lifestyle by showing goods as a way to become part of the consuming community” (Wissinger: 69). [vi]The relationship between the promotion and propaganda of Italian fashion and the production of the Luce newsreels was not straightforward. Rather, the Luce newsreels featuring fashion, which began in 1928 and continued well after the fall of the regime, are complex and rich and certainly deserving of the attention of scholars from a variety of fields of expertise, not only from fashion history. Hundreds of LUCE newsreels, now accessible through the Istituto Luce Digital Archive, covered fashion in the late 1920s and 1930s. . Even though Italian fashion had been nationalized and subject to policies that controlled production and marketing, the newsreels do not limit themselves to documenting and reporting on State initiatives. Two trends emerge from the newsreels: first, Italian fashion already appears linked to the traditions of several Italian cities (Rome, Turin, Milan, Florence, Venice) and historical locations with landmark architecture (Villa D’Este, Cernobbio, Como and others). The newsreels give no picture of a centralized Italian fashion, even in the throes of the regime’s nationalistic drive. Italian fashion appears to be the product of a plurality of fashion cities in the Italian peninsula (as it still is largely today); second, but not less important, in the newsreels we see massive attention given to foreign fashion from Paris, Berlin, Budapest, London, Sweden, even Shanghai and Mexico, and from the US, of course, clearly the main inspiration and the nation to which most space was dedicated. Analysis of the newsreels on fashion reveals two different components: one is the advertising and marketing strategies of the fashion film; the second is the use of the camera, the techniques of storytelling in a compressed time frame (usually about one minute or so), the formal aspects of the décor, landscape and background, the way models walk and their gestural performance. Massaie rurali, Great Parade of Female Forces, Rome, May 28, 1939, Istituto Luce, Rome. Salvatore stresses the importance of movement, gait and the gestural performance of the models, but also offers suggestions on the style to be adopted for modeling different kinds of clothing. She gives emphasis to the performance of a constructed naturalness, a certain sprezzatura, we may say, that shows off the clothing as if it belongs to the body that wears it and enhances its beauty. In a Luce newsreel of 1928, showcasing the “moda italiana a Milano,” models follow Salvatore’s tips, synchronizing their gait and movement according to the outfits they are wearing. Ample coverage is given to different fashion spaces such as an elaborate 1929 show at the Rinascente in Milan. Black velvet hat, tulle trimming held in place by red and light blue knots. From Bellezza, September, 1942. Biblioteca nazionale, Rome. It would be misleading to analyze the Luce newsreels, the hundreds of pictures published in fashion magazines and the photographs housed in several Italian archives and libraries solely in terms of political and ideological propaganda. Rather, they demand to be viewed in the wider context of film experimentation and theory, of their commercial aspect, and of the role that fashion and film have in the “Italian way to modernity” in conjunction with other film and documentary. A Luce newsreel, aptly titled “Un originale sistema di presentazione della moda” (An original system of presenting fashion, B0373: 1933), focuses specifically on how best to stage fashion. This short does not just present fashion, it also focuses on the ways fashion can be showcased in the most enticing and appealing of modes. It is a sort of an instructional video. These modes are extrinsically cinematic and are very much at the core of fashion parades in feature films. Proper fashion shows were to be incorporated into Italian cinema starting with Alessandro Blasetti’s 1937 film Contessa di Parma. “As if in movement” is what is at stake in staging fashion, in every way akin to the “perennial debates concerning film” that “involves the difference (and opposition) between the realistic (natural, real-seeming) and the real” (Rohdie: 104). In this way, the Luce newsreels, and especially those on fashion, need to be considered in the larger context and debate about film and image, and how fashion is relevant to this debate. The fashion show in Stramilano is elegantly staged in an intimate setting. The models’ gait is flattering, almost flirtatious; every gesture calls attention to a particular detail of the dress. The gowns are in shiny satin, fur trims and opulent collars accompanied by accessories like beautiful big fans in feathers or lace. Some of the models seem to walk so lightly that they resemble ballerinas. One customer, in particular, is singled out by the camera; we see her posing like a movie star while she attentively examines the clothes as they flow and flatter the model’s figure. Following the parade, we see four models standing still in front of the camera, filmed in full length, attentive to capture the details of cut, decorations and print fabrics. Later, the designer herself-- Palmer--shows the opulent and soft fabric to her clients. The fabric here takes center stage, thus going back to the previous episode of the film that focused on the production of textile and suggesting how its production is the foundation of dress. There is no doubt that the film is there to advertise Milan as a vibrant and modern city on a par with other important European metropolises. However, more than a promo, the film is remarkable on account of its formal and aesthetic accomplishments. The film juxtaposes factory workers, labourers, passersby in the misty atmosphere of the city early in the morning, tram drivers and market vendors, models in elegant settings, a fashion school, a night club, musicians and dancers. Above all, it juxtaposes people who seem to be stage actors along with people crowding the streets or going about their daily activities and work routines. The second part of the film opens with an episode dedicated to dance; here too we see dress and costume as a key component of the dancers’ gracious movement and rhythm. Some of the shots recall early experiments in filmmaking when a static camera captured movement through the flow of fabric and cloth, as in Louie Fuller’s dance style film. But here, of course, we are at another stage of filmmaking and the camera moves, dances, travels, is positioned on trucks and, in other experiments, on airplanes, to follow the rhythms and speed of modern life. Fashion here adapts to the svelte and dynamic silhouette of an urban woman who is eager to be beautiful and be part of the social scene. The film has, in fact, other shots in dance clubs where young people meet and, towards the end, shots of intermittent lights on a dark screen and in a dark Milan, we see advertising signs (Fiat, Brill, Magnesia etc). Milan appears for sure as a super city, a city of fashion and film, where fashion and film are inextricably bound together. Military-style overcoat, by Binello Sisters fashion house. Biblioteca Nazionale, Rome. [i] See Paulicelli E (2004) Fashion under Fascism. Beyond the Black Shirt, Oxford: Berg, for a more extensive treatment of the role of the ENM. [iii] Emily Braun (2002), “The visual arts: modernism and fascism,” in Lyttleton. [iv] Luigi Chiarini (1936), “Come si impara a fare il cinema,” in Cinema, reprinted in Orio Caldiron ed. (2002), “Cinema” 1936-1943. Prima del Neorealismo, Rome: Fondazione Scuola Nazinale del Cinema, pp. 70-71. [v] P.L. Erbaggio (2013), “Nazionale Luce: A National Company with an International Reach,” in Bertellini, Italian Silent Cinema, pp. 221-231. [vi] Wissinger, E., (2015), This Year’s Model. Fashion, Media, and the Making of Glamour, New York: New York University Press, p. 69. [vii] Ada Salvatore(1939), “La moda ieri e oggi,” Enciclopedia pratica della casa, Vol. 1, Milan: Garzanti, pp. 531-532. [viii] Elisa Albano, “Una casa di mode. Palmer” (1919), La Fiaccola. Rassegna Femminile d’Italianità, n 10-11-12, October, November, December. Milan and Rome: Editori Alfieri & Lacroix. I would like to thank Michela De Giorgio for sending me a copy of the article. [ix] Marta Palmer (1929), “Esiste oggi una vera moda delle vesti?”, L’industria della moda 11:1 (January, 24:27); and “I nostri modelli al Teatro della Moda di Milano”. L’Industria della moda, 11:5 (June): 20-21.